Barinder Saluja, Chandigarh,Sept. 27 : The first edition of Hero Cycles lndia Cyclothon took off with much fanfare and festivities today at Chandigarh with over 5, 714 turning out in various categories in the largest celebration of cycling at foothills of the Himalayas. Sport18, the sports marketing division of Network 18 group, along with Hero Cycles concluded the last competitive national road cycling event before the Commonwealth Games. 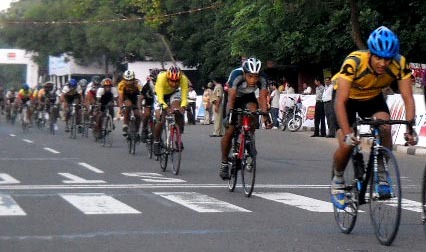 The race was held under the aegis of the Cycling Federation of lndia with race director Rakesh Mohindra. 15 national state teams participated in the 60 Km Hero National Elite Race that saw a close finish in the end. The Hero Cycles lndia Cyclothon was kicked off with the Hero National Elite Race followed by the Kids ride of 5 km, the Go Air Corporate Ride 10 km, the Hero Amateur Ride of 20 km and the LG Green Ride 15 km. Virendra Sehwag and O.P. Munjal ftagged off the kids ride while Mr. Pankaj Munjal ftagged off the Hero National Race along with Mr. S.S. Dhindsa, president of the Cycling Federation of lndia. The end of the Gala event of Cyclothon withnessed a Musicle Bonanza, in which renowned punjabi artists from Punjab Rocked the Stage with their electrifying performances and enthralled the participants and audience who danced to the tunes of their punjabi songs. Ashok Masti, Jasbir Jassi and Sandy regated the audience with their foot-tapping performances. The union territory of Chandigarh had for the first time hosted the lndia Cyclothon, a mass mobilization cycling event that promotes the practice of cycling, that has already traversed the key metros of Delhi, Mumbai and Bangalore over the last event. The concept of Cyclothon proves to be a big draw with thousands turning out to pedal on the roads to proclaim their support for greener and cleaner urban spaces. Participants from all walks of life – amateur cyclists, cycling enthusiasts, working professionals, housewives and school children, participated in the event. Mr. Ram Niwas, Home Secretary, Chandigarh elso graced the occasion along with S. Sukhdev Singh Dhindsa, Mr. Pardeep Mehra, Advisor, and Governor of Punjab & UT Administrator H.E Sh. Shivraj V Patil, gave away the prizes to the winners.